Tsunami, Pastrami, Salami? Oh… U-M-A-M-I. After sawing back and forth for lack of a real knife, I finally cut through the burger and was ready to give it my first try. As soon as I bit into it, a burst of flavor did in fact, fill my mouth. Mr. Fleischman wasn’t lying when he said that he wanted to give his menu a “umami” twist. Typically on these types of burgers, I enjoy myself some standard house-BBQ sauce to top everything off; And frankly, I was a little worried when I read that it would be served with ketchup and mustard. But boy, did it not disappoint. The sourdough bun is always a winner, and of course so is the ground beef. But I had never had “beer-cheddar” cheese before, and in truth, I hope I don’t again. It wasn’t that it tasted bad, it’s that I didn’t taste it much at all. I had also never knowingly had smoked salted-onion strings; However, they did the burger justice, adding that smokey flavor that was absent as a result of not using the typical hickory smoked bacon. And I thought I hadn’t had “bacon lardons” either, until I looked up what the word, “lardon” meant: french for a small cube or strip of pork fat. Definitely had that. And even though it wasn’t a first, it hopefully won’t be my last. When one, or a couple, lardons would be in a bite… Oh-wee it was bacon heaven! Although there were no “greens” on the burger, it did have a lighter feeling then others. Problem was, as I ate through the burger, I would get gaps in between the bursts of flavor. Whether this was due to a construction problem, or that of ingredient choices, doesn’t matter to me. What matters is how every bite of the burger was. And this one was 50/50. 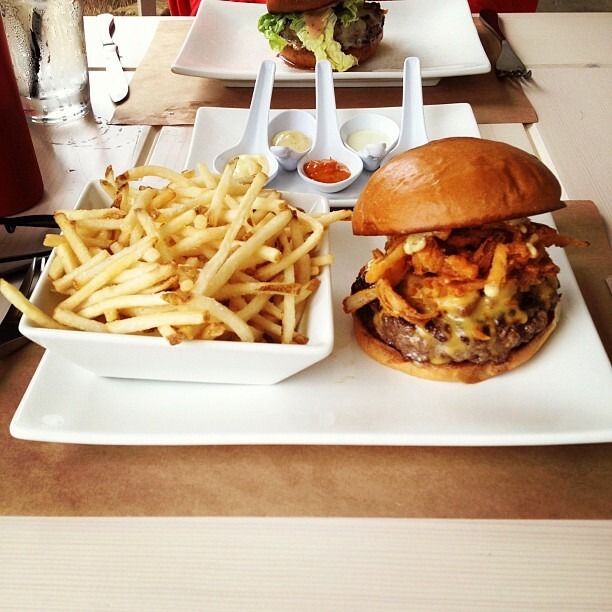 The other issue I had with Umami Burger was the fries. Not only did I have to order them separately from the burger at $3.50 a pop, but they were… life-less. Barely fried, barely any flavor. I would have rather eaten In-N-Out “well-done” fries any day, over that bowl of sadness. My judgement: In all honesty, the burger was most definitely “umami”. The problem was, it went, just as fast as it came. The flavor was in ‘n out of your mouth, faster then ordering at the drive-through. And sadly, it wasn’t worth the price. At $15.50 for just the burger and fries, I could have bought myself 4 In-N-Out hamburgers and 4 In-N-Out fries. Clearly, we have ourselves a problem. That said, if you have extra money to spend, and want to try a uniquely-flavored burger, I would definitely recommend Umami. But if you’re on a budget, like most of us, your money is better spent elsewhere. Thus, it found it’s mark at #9 Umami Burger’s Manly Burger, in between #8 Yard House and #10 Fat Burger. I just went there for the first time a few days ago. The burger was really good but I thought 15$ for a single burger & a side of fries was kind of ridiculous. I’ve had better burgers for less, plus they charged a refill for a $2.50 lemonade, which I don’t even think was real lemonade. Great burger, but not worth the price or the wait. I’ll be eating burgers elsewhere from now on. Just went there surprised they have a veggie burger. GET THE EARTH BURGER. so bomb. Even if you aren’t vegetarian…You’ve gotta try this thing. It’s an edamame patty!